This title was first published in 2003: As new medical technologies and treatments develop with increasing momentum, the legal and ethical implications of research involving human participants are being called into question as never before. 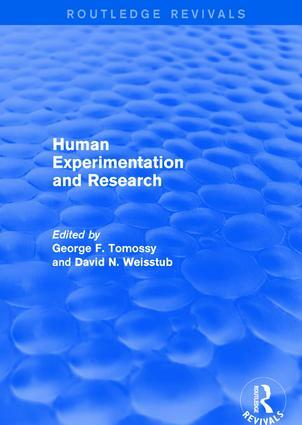 Human Experimentation and Research explores the philosophical foundations of research ethics, ongoing regulatory dilemmas, and future challenges raised by the rapid globalisation and corporatisation of the research endeavour. This volume brings together some of the most significant published essays in the field. The editors also provide an informative introduction, summarizing the area and the relevance of the articles chosen. Are Research Ethics Bad for Our Mental Health? Are Placebo-Controlled Trials No Longer Appropriate?